Restaurant Laurent is a Michelin-starred restaurant that featured an extensive wine list – because the current owner was a sommelier by origin. The owner Philippe Bourguignon was once named France’s Best Sommelier. Enough of the owner, it’s the chef Alain Pégouoret that I came to try. He worked on his craft under greats like Christian Constant and Joël Robuchon, and got a reputation within creativity and vegetable dishes. We booked the family for dinner and dressed appropriately for the occasion. This was after all a Michelin 1-star restaurant in heart of Champ Elysee. We were showed to our table by our waiter for the evening. The main dining hall was elegantly decorated and the service crew was quite surprised to see a 4-year old in the room at 8pm. As for the dinner choices, you either go for the a la carte items, or the whole table shall eat the set menu – quite authoritarian. We ordered a series of a la carte items and sat back to enjoy our dinner. First up, the amuse bouche – A lightly poached sea bream on a bed of sour cream with salmon roe as condiments, accompanied by a mixed grain piece of savoury shortbread. The waiter explained that the piece of sesame biscuit that held the fish and cream together was specially made in the restaurant. What amount of effort for just the amuse bouche, we could not wait for our hors d’oeuvres and main courses. 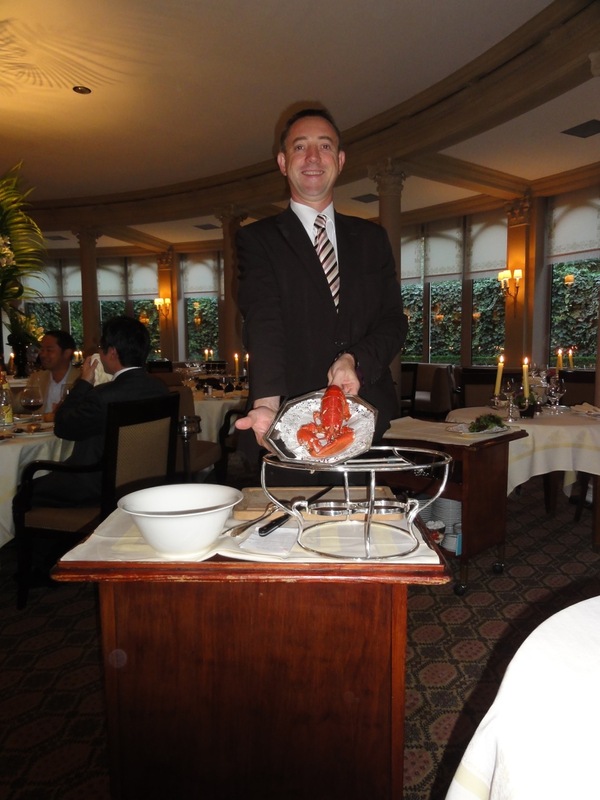 The first was a lobster salad prepared by your table. This is really an old and traditional way of preparation as most modern French restaurants have skipped table side service altogether. The waiter took the meat of a whole lobster and mixed it with the dressing and salad – not much of a show, and nothing to shout for except it was a big lobster for 98€. 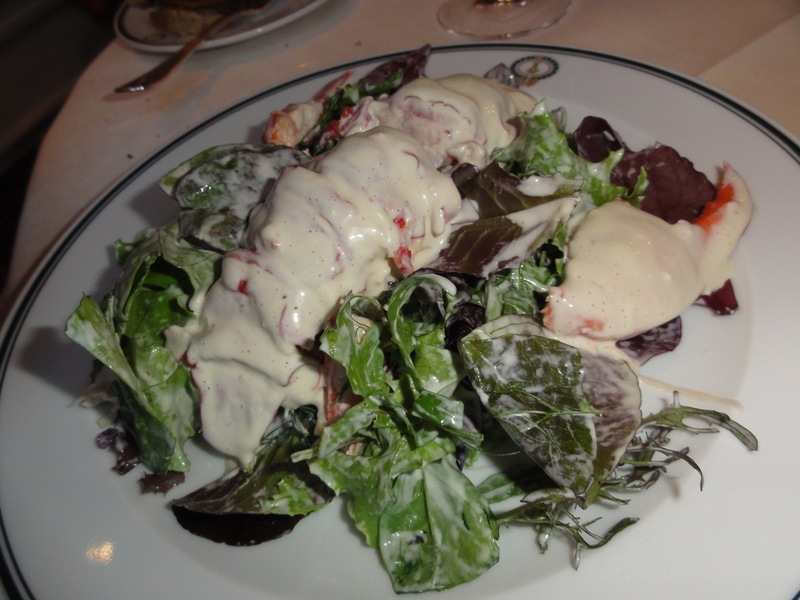 The sauce was a tangy butter cream dressing with lemon on a bed of lettuce, rockets and other greens. We could have done this at home ourselves, although I must admit the lobster was cooked to perfection and retained all the natural flavours. 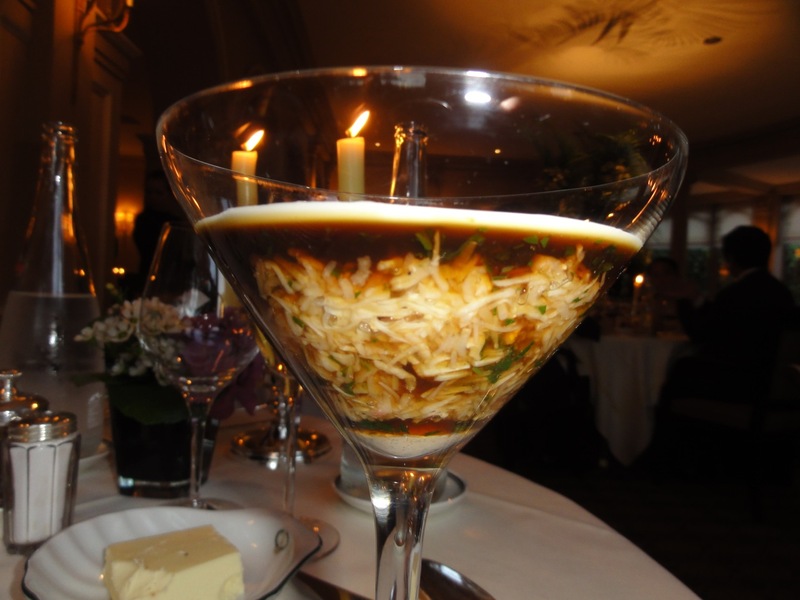 This appetiser was delightful – the natural sweetness of crab meat sealed by a reduction of the crab juices. Mixed in the crab meat was the cream (or roe) of the crab and the fennel cream took away all the fishy-ness from seafood. French food names left little to the imagination. 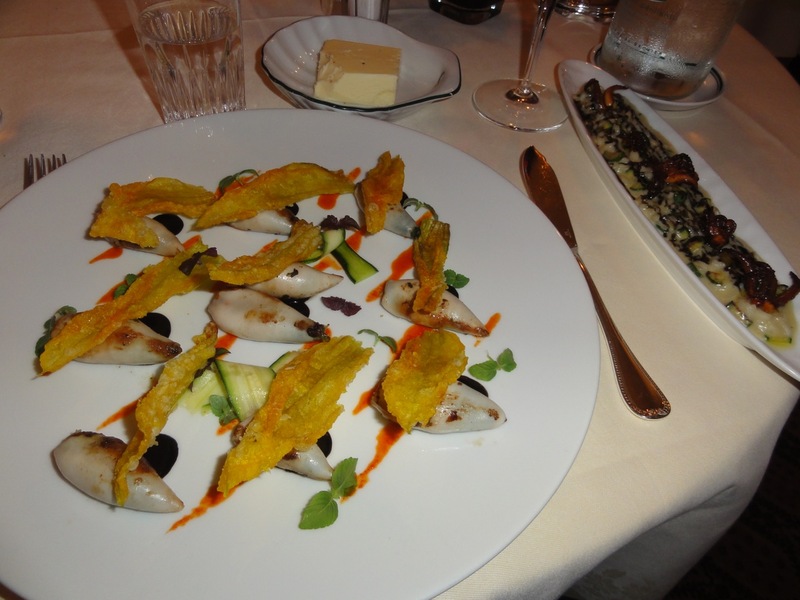 This first main course was exactly what it was called – small squids grilled on a cast iron skillet with squid ink sauce accompanied by deep fried flowers of the zucchini plant and served with risotto on a side. Pardon the picture, as the camera flash did not manage to cover the risotto as the room was really too dim. The plating of this 67€ dish was excellent – it was artistic and you just had to look at it a bit longer. But the food beckoned and we took a bite and found it too bland. The risotto made up for the salt, so we had to eat them in combination. I wondered if that was the intent. We all loved foie gras, and throughout our week in France, we had foie gras almost every meal (except breakfasts). This was a good example of foie gras with a vinegar wine (Banyul) sauce with figs and almonds as sides at 50€. 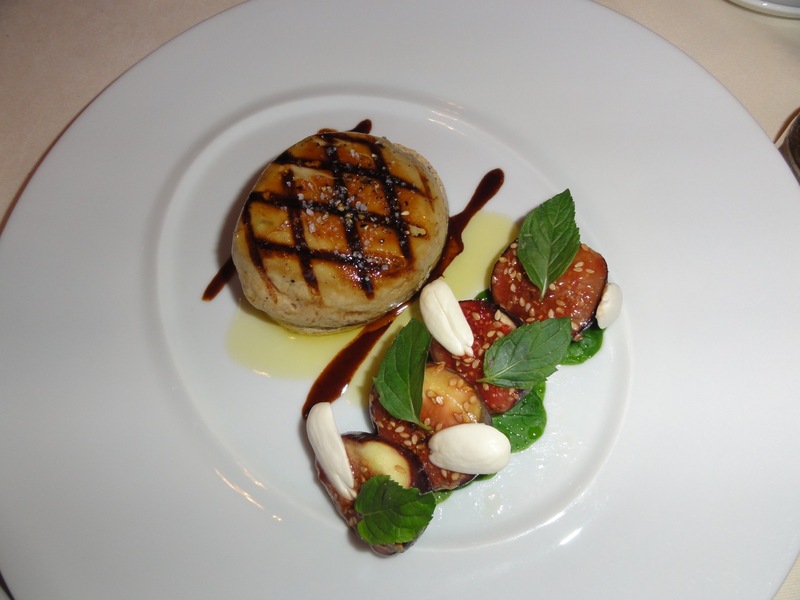 The figs were grilled and released the sour-sweet juices that complimented well with the fattiness of foie gras. THe mint and almonds were there for fun, and I felt that it was not worth the high price. 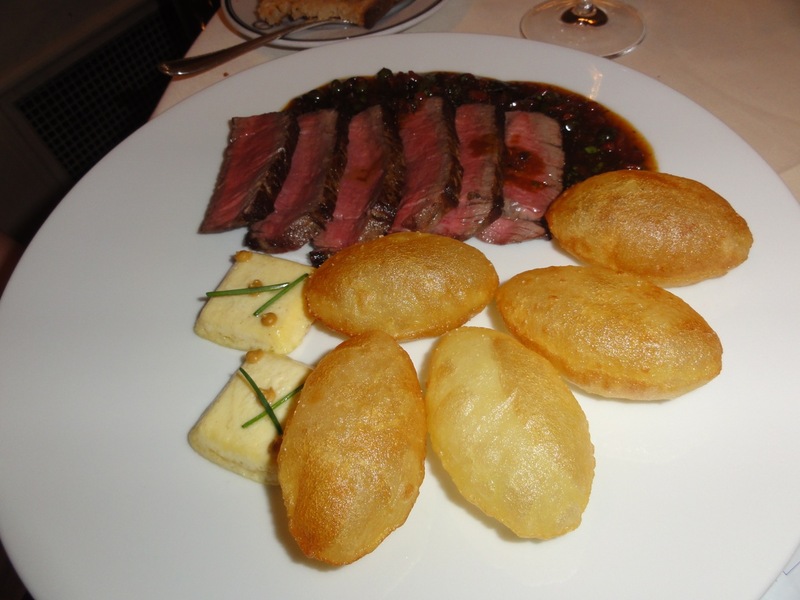 For myself, J the Carnivore, I ordered the Roasted strips of beef with herbal juice served with “pommel soufflés Laurent” or puffed up dough Laurent-style. Again this was reduced from 88€ to 77,5€. I really wondered how could tax reductions be applied to certain items and not others, especially when it was a universal tax like VAT. Go figure that. The beef was grilled to perfection at medium rare. The sauce reduction was tasty and went well with the puffs. Overall a great dish. Of course my wife was not impressed because her idea of beef is Wagyu only. The reason I have mentioned all the prices of the dinner is because I want to highlight a rather unpleasant experience towards the end of the dinner. As we were switching back our biological clock by 7 hours, and dinner is really lunch time for us. and this being the second week in Europe, all our biological clocks were whacked. For a 4 year-old, she just wanted to go to sleep as she had adjusted the best among the 3 of us. So we pulled up 2 chairs to let her lie down, but was immediately stopped by the Maitre’ D. We asked for our stroller instead, and he said it was not allowed in the main dining hall. We can either put her in a stroller and moved her to a empty private dining room outside, or keep her awake. Well, you cannot stop a sleepy 3 year old, so we decided on Option 3. We asked for the bill and left. 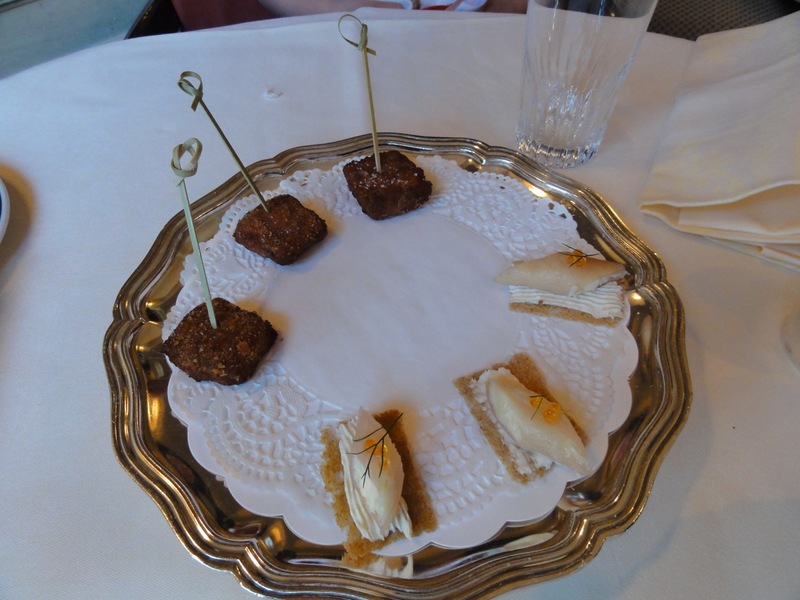 Therefore we never had the chance to try the desserts or petit fours. Here’s the advice for all those who are travelling with kids – make sure you checked if the restaurant is child-friendly. If you really want to go for Michelin-starred restaurants, go in the afternoon or leave the kids with a babysitter if you have to go in the evenings. This experience taught us a lesson on the “high” standard these guys try to maintain, especially the ambiance of the place. Even when you spent more than 500€ for dinner for 2 adults.